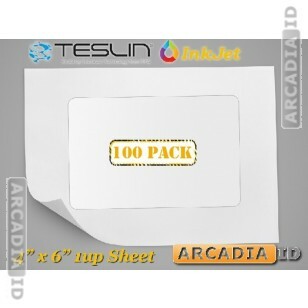 Packs of 100 sheets of Teslin® paper with 1-up punch outs. This means you can create 100 new photo IDs with this high quality paper that looks and feels great and that always stands the test of time. Suitable for Inkjet printers. Can't find what you're looking for? Call us anytime and we'll be happy to help. For the best products and value trust ArcadiaID.